Drilling for blood: Aedes aegypti mosquito on human skin. Mosquitoes have evolved resistance to numerous insecticides. The Alaskan hermit crab is commonly found from Alaska to California. Jan Haaga, courtesy NOAA Kodiak Laboratory. Think evolution is just a problem for academic biologists? Think evolution causes only gradual change? Dismiss evolution as a plot by Godless scientists? Think evolution is, well, free? If you answered "yes" to any of these questions, we point you to a recent study by Stephen Palumbi, a professor of evolutionary biology at Harvard University, who finds evolution going on all around him. He sees it on the farm. In the hospital. Even the golf course. Now that humans are tampering with so much of the planet, it should not be surprising to see a basic force of biology coming into play. But what is surprising, Palumbi says, is how quick, and how expensive, evolution has become. "Evolution as a process is not only fast, but also pervasive," he says. Now we'll admit that he's talking about evolution on the molecular scale -- the way insects and microbes develop new ways to deal with their chemical environment. But as we'll see shortly, evolution on this scale is just as momentous as, say, elephants growing wings. In fact, Palumbi says evolution is literally in your face. "Every time you go to a doctor for a sore throat, and he jams a stick in your mouth for a throat culture, the reason is because it's really important to find out what [drugs] your infection is susceptible to before treating you. That jab is the price of evolution." Part of the price, at any rate. Take the case of staphylococcus aureus and HIV, two pathogens that mutate quickly to evade drugs. Treating the drug-resistant varieties of these infections costs upward of $30-billion in the United States each year, Palumbi calculates. 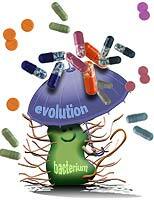 Fast evolution is also evident, he argues, on farms, where vast quantities of antibiotics are used as growth enhancers, and where weeds can evolve resistance to herbicides in just a decade. Mosquitoes, famously, have evolved resistance to DDT, causing the collapse of a world-wide effort to eradicate malaria. More than 500 insects were resistant to at least one insecticide by 1990. A trait (for example, the ability to survive an antibiotic) varies in different individuals of a species. This trait affects survival and/or reproduction (in our example, bacteria that decompose the antibiotic are likely to outlive their peers). Offspring can inherit the trait (the enzyme that digests the antibiotic is made by a mutated gene. This gene is present in daughter cells). Any time you have these conditions, Palumbi says, you can have evolution at work, and you may find evolution in odd places, not just among insects and pathogens. Pink salmon, Palumbi says, evolved to be 30 percent smaller in two decades. The larger fish got caught in nets, causing a genetic change so their descendants grow more slowly. Hermit crabs grew larger to fit the shells of bigger snails that were introduced to the Northeast United States. 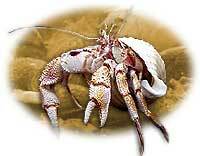 (Hermit crabs, you'll recall, borrow their shells from other crustaceans as protection against predators). Male guppies have evolved bright colors because females prefer to mate with neon-bright fish. But when experimenters introduced a predatory fish into a stream in Trinidad, bright male guppies in the stream died and a drab population -- which were harder for predators to find and eat -- evolved. The evolutionary change was far more rapid than normal, Palumbi says. Even if you think guppies were made to be eaten, there's an ominous message in this spate of human-forced evolution. Palumbi sees it as an "emergency," most obviously regarding HIV, which mutates so fast that no single drug can control it. The strong language is meant to stress the importance of understanding how evolution works in a human-dominated world, Palumbi says. "Think about the explosion of HIV in Africa. Even if you could send one drug to treat everybody on the continent, it would not necessarily be a good thing, since you'd end up with continent full of drug-resistant HIV." In the United States, he notes, standard AIDS therapy includes three strong antiviral medicines. "The lesson from evolution is that anything less is dangerous," he says. Since resistant pathogens and pests are, by definition, hard to kill, how to deal with them? Palumbi says preventing resistance makes a lot more sense than trying to deal with the problem after the fact. Cattle raised with regular antibiotic treatments help spur the development of antibiotic resistance. In essence, he advocates keeping the sword sharp by using it less. Today, he says, the response to antibiotic resistance is tardy. "Generally hospitals wait until they see signs of resistance ... then switch drugs, but it's too late." Far better, he says, would be to cycle through the available antibiotics as a matter of habit, changing drugs before resistance is established. Presumably, the few bacteria that resist antibiotic A would not also resist antibiotic B, reducing the chance of dangerous multiple resistance. Although a similar strategy is being tested in agriculture, he says medical folks and farm researchers seldom talk, even though both confront a similar problem, governed by a similar force -- evolution. Evolution is the organizing principle of biology, he adds, and to practice medicine or agriculture without considering evolution makes no more sense than designing a bridge while ignoring gravity. Humans as the World's Greatest Evolutionary Force, Stephen Palumbi, Science, 7 Sept. 2001, pp. 1786-90. The Evolution Explosion, Stephen Palumbi, WW Norton & Co., 2001. ©2001, University of Wisconsin, Board of Regents.